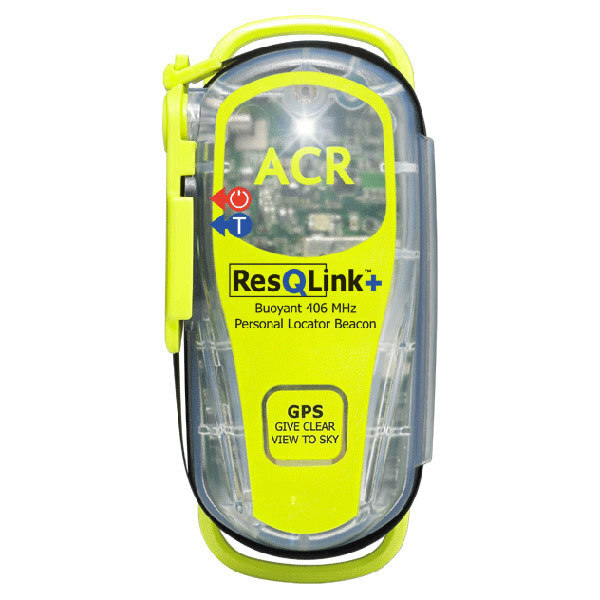 At 5.4 ounces and just 4 1/2" long, the ResQLink+™ is small enough to be easily carried in a pocket, clipped to a backpack or stored inside an inflatable life jacket. ResQLink+™ offers three levels of integrated signal technology—GPS positioning, a powerful 406 MHz signal and 121.5 MHz homing capability. In an emergency, it relays your position quickly and accurately to a worldwide network of Search and Rescue satellites, while the built-in strobe light increases your visibility. Includes GPS and self-test features that can be combined with ACR’s optional 406Link.com satellite confirmation testing service. Three integrated technologies: With three levels of integrated signal technology—GPS positioning, a powerful 406 MHz signal, and 121.5 MHz homing capability—the ResQLink+™ quickly and accurately relays your position to a worldwide network of search and rescue satellites. A built-in strobe light provides visibility during night rescues. Proven record of global rescues: PLBs have been proven in some of the world’s most remote locations and in treacherous conditions. Just ask the 400 or so pilots, boaters and backcountry explorers who were saved by a PLB during a rigorous test program in Alaska. Based in large part on the test results, the federal government approved use of PLBs in the United States in 2003. Simple to deploy: Even in extreme conditions and situations, the ResQLink+ activates easily. Just deploy the antenna and press the ON button. With its powerful 66-channel GPS, the ResQLink+™ guides rescuers to within 100 meters or less of your position. And, in the continental US, search and rescue personnel are typically alerted about your position in as little as five minutes with a GPS-enabled PLB like the ResQLink+. Easy self-test: Two built-in tests allow you to routinely verify that your ResQLink+ is functioning and ready for use. With the push of a button, you can easily test internal electronics and GPS functionality. Waterproof Rating: Submersible to 16.40' for 1hr. ; 33' for 10min. WARNING: This product can expose you to chemicals including Diisononyl Phthalate (DINP) and Bisphenol A (BPA), which are known to the State of California to cause cancer and birth defects or other reproductive harm. For more information, go to www.P65Warnings.ca.gov.